Chasing the Leader: Healthcare Vertical Integration follows Optum Model | Bailey Southwell & Co. 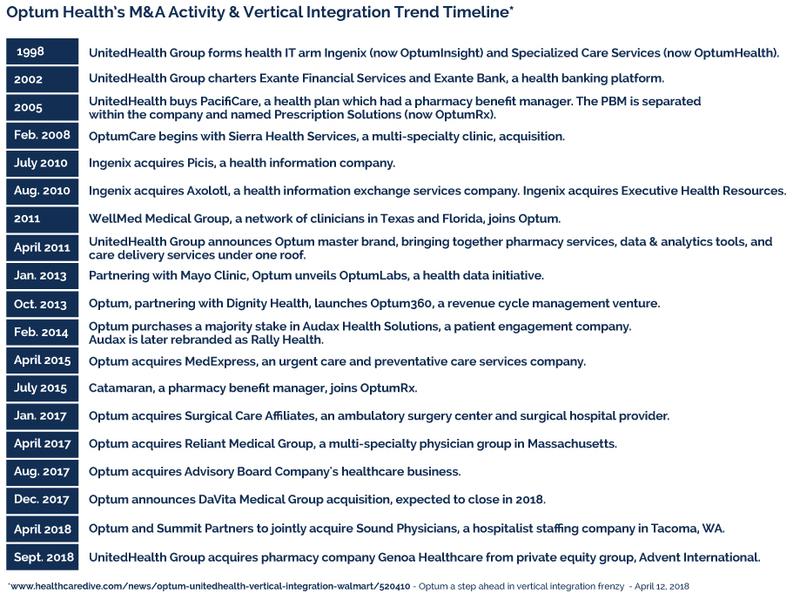 The value imperative continues to shape U.S. healthcare M&A activity in 2018, as payers align acquisition strategies to chase the industry leader in vertical, value-based integration, UnitedHealth Group (NYSE: UNH) and its Optum unit. Although best known as a provider of health insurance, over the last decade United has grown into one of the largest employers of physicians in the U.S. by consolidating acquisitions in its OptumCare subsidiary. When it closes, United’s $4.9 billion acquisition of DaVita Medical Group, announced last December, is expected to bring the number of physicians under the OptumCare umbrella to more than 45,000. 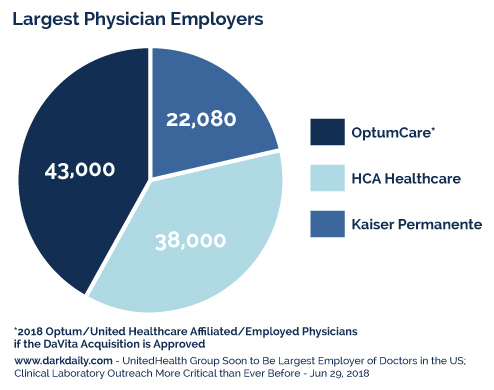 That would surpass the approximately 37,000 physicians employed by HCA Healthcare and the 22,000 under Kaiser Permanente, currently the largest physician employers in the nation. Branded as Optum by United in 2011, the roots of United’s physician practice business date to its 2008 acquisition of Sierra Health Services, a Las Vegas-based healthcare services company that included a multi-specialty medical group. Subsequent clinic and practice acquisitions have taken the company into nearly half of the 75 U.S. markets that executives say they target for expansion. Just as significantly, Optum has not stopped at OptumCare’s clinics and practices, broadening its larger OptumHealth portfolio to include urgent care and ambulatory surgery centers. 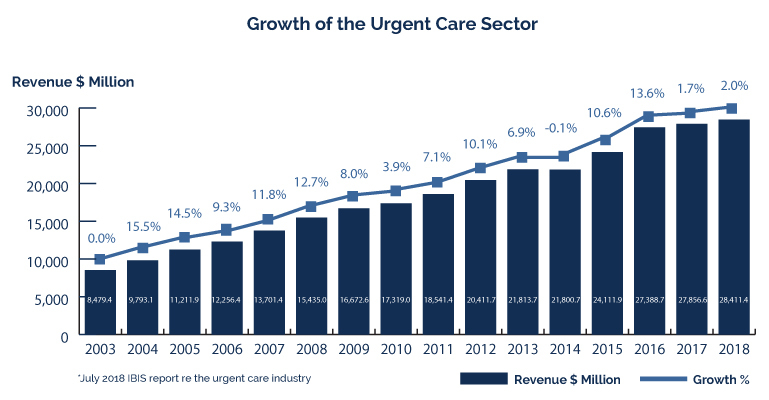 The unit currently operates some 230 MedExpress urgent care sites and more than 200 ambulatory surgery centers and surgery hospitals that served 91 million people in 2017. The DaVita deal will significantly strengthen Optum in both areas, boosting the unit’s presence in several key markets — including California, Colorado, Florida, Nevada, New Mexico and Washington state – and including not just physician clinics but also surgery centers and urgent care facilities. The company has said it plans to continue making acquisitions and growing its infrastructure toward that goal of reaching its 75 key U.S. markets. Optum held true to its word in April when it announced the joint acquisition of Sound Physicians, a staffing company focused on hospital medicine, with private equity firm Summit Partners. With this acquisition, Optum will not only expand its OptumHealth portfolio but continue its focus on care delivery. And yet again in September when UnitedHealth Group, Inc. acquired pharmacy company Genoa Healthcare, the nation’s fifth largest pharmacy with 435 locations, from private equity group Advent International. The company shows no signs of altering its acquisition strategy. This model – vertical integration, plus a horizontal approach that attempts to connect with consumers at multiple stops along the continuum of patient care – has become the target for other leading payers like Cigna Corp., Anthem, Inc., Humana and Aetna Inc.
For all of them, the goal is to build the infrastructure necessary to reap the benefits of the shift from fee-for-service to value-based care payments. Where past mergers were driven by efforts to command greater market power, integration of care delivery and the search for cost reductions represent the new imperative. Ongoing: Reports continue to circulate about a potentially expanded partnership between retail giant Walmart and Humana, the largest remaining independent pharmacy benefits manager. The thread that runs through all the activity by United and the payers in pursuit is an effort to capitalize on controlling multiple care touch points with consumers and leveraging shared data from those interactions to control risk, improve outcomes and contain or even lower costs. Thus, the myriad of delivery sites seen in the recent flurry of M&A activity: big box stores; pharmacies; ambulatory surgery centers; urgent care clinics; traditional physician practices; and home care. Aetna’s leadership has gone so far as to say that the company wants to shift the profit center of a merged Aetna-CVS entity to the store and clinic level. CVS has 10,000 retail stores that are within a 5-mile drive of 80% of the American population, operates more than 1,100 medical clinics and has nearly 90 million members in its PBM. The past decade has seen explosive growth of retail medical clinics; there are now estimated to be more than 12,000 U.S. urgent care and retail clinics, often staffed by lower-cost nurse practitioners and physician assistants. At the same time, the traditional point of entry to the healthcare system, the primary care physician’s office, is in a long-term decline, with insurance data showing primary care visits declining by 18% between 2012 and 2016. Playing defense against the payers, hospital systems and large physician groups have been getting into the urgent care clinic business, despite the fact that such sites operate at substantially slimmer margins. Back in the 2000s, it was hospital systems leading the vertical integration trend, buying up doctor practices who would affiliate with the hospital system and direct their acute patients there. Studies, however, found that these relationships often resulted in increased health care costs (and increased costs for payers). In the current environment, payers see value in hedging their bets via diversification. Yes, physician practices are good points of connection – but so are surgery centers and urgent care sites and retail clinics. Diverse networks offer the prospect of payers being able to control referrals across the network – for example, from an urgent care clinic to an affiliated pharmacy, then to a connected specialist physician practice for follow-up. Proponents offer visions of vertically integrated systems creating one-stop healthcare shopping centers, with nearly all care managed at a single location, whether physical or virtual. And – as in so many other areas of the economy – the specter of Big Data looms over all the tie-ups. To the health care organization that combines, analyzes and draws clear conclusions from a patient’s claims, electronic medical history, pharmacy and (in the case of Walmart and CVS) retail spending goes the opportunity to streamline care and decision making, identify best practices and partner with other providers on targeted innovation and solutions. The vertical integration push has met with resistance from some quarters. In August 2018, the American Medical Association said it believed the proposed CVS-Aetna deal would reduce competition in many markets and ultimately hurt patients, a position that has been echoed by some members of Congress as well as state officials. Independent healthcare providers and service providers like medical imaging centers and laboratories are also being challenged to optimize their efficiency as payers look to funnel patients to their integrated service providers. But while some investors have questioned the trend to vertical integration, the reality is that none of the major pending deals is viewed as being imperiled by shareholders or antitrust enforcers. The primary uncertainty currently hovering over the industry is what disruption might come of the health care partnership announced in January 2018 by Amazon, JPMorgan Chase, and Berkshire Hathaway. Berkshire Hathaway is already in the insurance business (though not the healthcare end of the industry), while JPMorgan Chase is the work’s sixth-largest bank by assets. And of course, Amazon has an unprecedented track record of using data, analytics and low-margin, customer-focused delivery to disrupt established industries. While the specifics of how that partnership will play out remain to be seen, payer-led vertical integration stands as the industry’s current best shot at reversing decades of runaway cost growth. And United and Optum are by far the furthest down the road to realizing the potential of value-based care to reduce risk and lower costs. To better understand how your small or mid-sized healthcare business fits into the current landscape, we encourage you to reach out to BSC’s team of experienced professionals. With over 100 years of combined experience and more than 200 transactions, our senior professionals execute complex transactions on behalf of entrepreneurs, owner-operators, private equity investors and strategic investors. Contact us to learn more.